The Iraqi journalist who hurled his shoes at former US President George W Bush has had his sentence cut from three years to one year on appeal. Muntadar al-Zaidi's lawyer argued that the charge should be changed from assault to insulting a foreign leader. The judge agreed and reduced the term in line with the less serious offence. An official for the court said the presiding judge had also taken into account the fact that Zaidi had no prior criminal history. "The appeal court issued its decision today... taking into consideration that he [Zaidi] is still young and doesn't have any previous convictions," said Abdul Sattar al-Birqdar, the spokesman for the Iraqi judicial council. 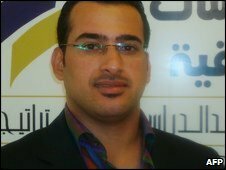 Zaidi's lawyer, Yaha al-Ittabi, said the decision showed "the independence and the integrity of the Iraqi judiciary". Shoe hurling is a grave insult in Arab culture, but Mr Bush - who was on a farewell trip to Iraq at the time - shrugged off the attack. The shoe attack happened in mid-December 2008 during a news conference Mr Bush was holding with Iraqi Prime Minister Nouri al-Maliki. Zaidi, of al-Baghdadiya TV, called Mr Bush "a dog" and threw his shoes as a "farewell kiss" from Iraqis who had been killed, orphaned or widowed since the US-led invasion. "I had the feeling that the blood of innocent people was dropping on my feet during the time that he was smiling and coming to say bye-bye to Iraq with a dinner," Zaidi said during his trial in March. He was overpowered and arrested and his actions were condemned by the Iraqi government as "shameful". But the shoe attack, at a globally televised news conference, was celebrated across the world by critics of the outgoing US president, who ordered the 2003 invasion of the Iraq. An opinion poll carried out for the BBC and ABC - the full results of which appear next Monday - suggested 62% of the Iraqis polled considered Zaidi a "hero". Some 24% of the sample said they viewed him as "criminal", while 10% thought he was a hero and criminal equally. Taking into account pre-trial custody and the customary reductions of sentences, Zaidi is set to be released on 14 September.